This year’s Grace Agenda is coming soon in March, and to make it easier for you to attend, all admission costs have been waived! 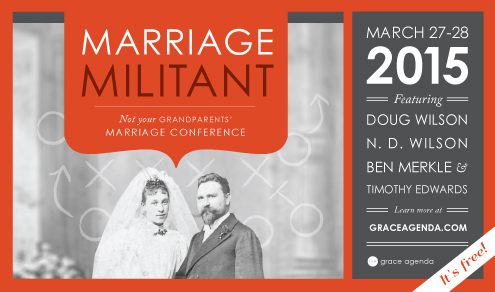 The topic for this year’s conference, as you can see below, is Marriage Militant. On Friday we Femina girls will be hosting a pre-conference event on the topic “A Woman’s Worth.” We’ll be speaking on four different aspects of our calling to be worthy women: Courage (by Rachel), Loyalty (Heather), Contentment (Nancy), and Faithfulness (Bekah). If you attend the femina pre-conference, you’ll be invited to join us in a complimentary luncheon. We’d love to see you all come, of course, and we would appreciate your prayers as we prepare to host this event. You can get all the details here. Even though it is free, be sure to register. We have been so blessed by the previous years of Grace Agenda, and we actually registered yesterday for this one! What a blessing and joy to look forward to the encouragement, exhortations, and fellowship. We will definitely pray for the preparations and planning! Thank you for your sacrifices to serve so many of us in this way. I just proposed the idea to my husband, and we may actually make the journey from Portland (Oregon) to come (pending childcare, of course) YAY! Thank you so much and praying for you all as you prepare! Hope it works for you to make the trek to Moscow! If you go to the registration site (even though it’s free, you still need to register), and scroll down a ways, you will find travel information that includes a list of hotels in the area. 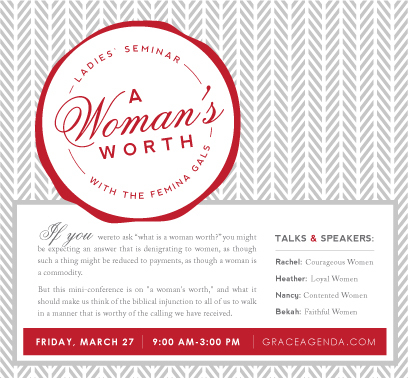 Just curious, since you ladies will be speaking on the topic of “A Woman’s Worth”: why is it that your talks will only be part of a “pre-conference event,” rather than a part of the real Grace Agenda conference–which by the looks of the poster will only feature men speakers? It sort of makes it seem like women’s voices are…less worthy. Actually, Rowena, quite the opposite is true. The Femina conference is just for women. We are happily excluding the men, though we do not think they are inferior because they aren’t invited. The Grace Agenda is for one and all. (There is also a pre-conference event for pastors.) Bekah, Heather, Rachel, and I are firm believers in women teaching women when it comes to opening the Word (1 Tim. 2:12). That’s why this blog is called Femina and that’s why our posts are directed to women. And believe me, not one of us is wishing it were any other way! When we take God at His Word, He gives us great satisfaction in our calling. When we try to bend or twist it to suit ourselves, we fall short of all the good and glory of our calling in Christ. It turns out that when we obey Him, we find our worth in Him and not in comparing ourselves to the guys. Thanks for the reply, Nancy. I understand and appreciate that you believe in women teaching women and that all (men and women) are welcome to attend the Grace Agenda conference. But my question remains: why aren’t your and your daughters’ talks part of the Grace Agenda conference itself, rather than part of a women-only, pre-conference event? Are you, as women, welcome and worthy to speak at the Grace Agenda conference? Will there be audio recordings available of the “A Woman’s Worth” for those unable to attend? Will any of these teachings be available online afterwards? I would love to come, but we are on the east coast! But we are part of Grace Agenda! You are maybe reading way too much into the term pre-conference. The pastors’ conference and the Femina conference both begin and end before the main event. Are you thinking that we are being insulted because we (as well as the pastors’ conference) are not the main event? If so, that is funny. No, “insulted” is not the word I have in mind. “Marginalized,” perhaps. I realize that what I am trying to get at is actually a much bigger question than you probably want to get into in the comment section to this particular post–but I would love to hear you address it, perhaps in a post of its own. Basically, as a longtime reader of this blog and as someone who is well-acquainted with your and your husband’s ministry and NSA, I have long wondered about something but never come out and asked it. I guess my curiosity finally reached the tipping point with this “pre-conference,” women-only event, perhaps because it is entitled “A Woman’s Worth.” My question is this: do you and Doug think that women may speak/teach at Christian conferences (such as Grace Agenda) where the audience is a mix of men and women? Relatedly, do you and Doug think that women may teach as professors at NSA? If so, why have the speakers for the past few Grace Agenda conferences (as far as I can find records online) all been men; and why is the NSA faculty exclusively male? If not, why not? Or to put it another way, I’ll repeat my earlier question (which I still don’t think has been answered): are you, as women, welcome and worthy to speak at the Grace Agenda conference? I’m genuinely curious about this issue and would really love to hear your answer to my question above….hoping that you can answer at some point. Rowena has a point, and I have to say that I agree with her. Let’s say C.S Lewis was still alive and that you were having a Lewis conference. Let’s also say that you had relegated him to the pre-conference portion of the conference, but not to worry there would be plenty of Lewis scholars to talk about him during the main portion of the conference. That would be silly and disappointing. This is not church, it is a conference. If women can’t speak here where can they? Rowena, perhaps I can’t give as full an answer as you’re looking for, but I can say that I know for certain that NSA has nothing against women professors – when I was a Freshman and Sophomore there, my Latin teacher was a woman. She got married and is raising a family now, and that is actually a big part of the reason that you don’t normally see women professors/speakers, etc. around here – usually their main focus is on their husbands and children at home, not lesson planning and lecture writing. As another example, I would love to have children but so far that has not been in God’s plan; so for right now I’m busy with teaching children at Logos school, and in the summer I was invited to speak to a mixed audience on Music at the annual Logos Teacher Training. Someday I may have my hands too full to do that, so I was thankful for the opportunity. Anyway, in my understanding, yes, women are welcome to be teachers, it’s just more often men on the podium because men more often have that vocation. All the best! Allie, thanks very much for responding. I was beginning to think this place had become a ghost town! I do appreciate hearing your insight on my question. I am still holding out the hope of hearing from Nancy regarding my question, even if it’s just to confirm your impression of the reason that women aren’t speakers/teachers at NSA and Grace Agenda (i.e. that it’s just the way things tend to shake out because of vocation, rather than any explicit or implicit policy). Thank you for your perspective, Allie! While reading through the history of Israel’s kings, my 6-year-old wondered why there weren’t queens. After pointing out Deborah and Jezebel, I wondered aloud if maybe the queens had more important things to do than rule the people 🙂 (Elizabeth I seems to affirm this view – effective as a ruler bc undivided). I want my boys to view their future queens as having noble work to do.